The need for transparency improvements and reliable audit trails has taken multi-asset class TCA mainstream. Boston, June 28, 2018 – The best execution requirements of the revised Markets in Financial Instruments Directive have motivated institutions to explore transaction cost analysis solutions offered by a variety of market participants—fintech firms, trading venues, banks, dealers, and others. Will the TCA arms race translate into more and better technology, benchmarks, and functionality? 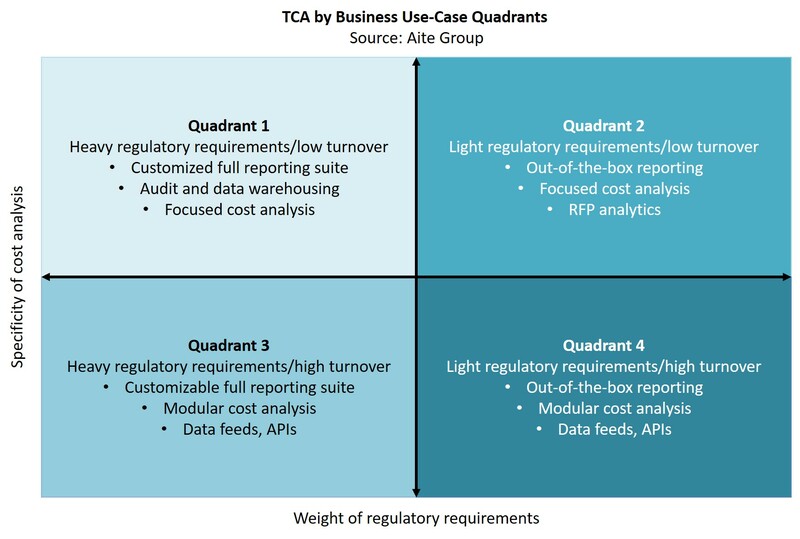 This report details several trends in TCA and profiles the following TCA providers: Abel Noser, Babelfish, BestX, Bloomberg, FactSet, FIS, GTA, IHS Markit, ICE Data Services, ITG, Liquidnet, LiquidMetrix, MarketAxess, OneMarketData, State Street Global Exchange, TPICAP, Trade Informatics, and Tradeweb. It is based on Aite Group interviews of 18 global firms that offer TCA solutions to buy-side and sell-side clients. This 55-page Impact Report contains five figures and 23 tables. Clients of Aite Group’s Institutional Securities & Investments service can download this report, the corresponding charts, and the Executive Impact Deck.